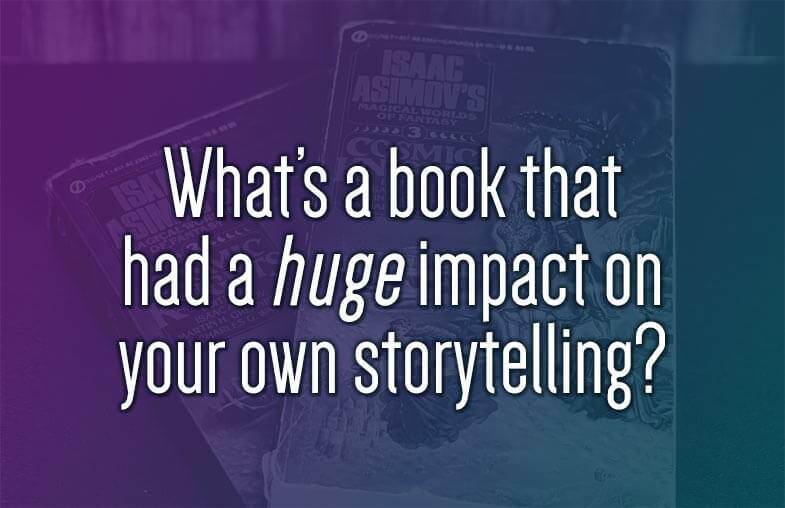 Writers – What is a book that had a HUGE impact on your own storytelling? I’m sure there have been many, many authors (and filmmakers and other creators) whose work has influenced yours in enormous fashion. But what I want to explore here is a singular work that sent ripples through your imagination. A story that took seed in your mind, that you can trace the roots into your own stories. 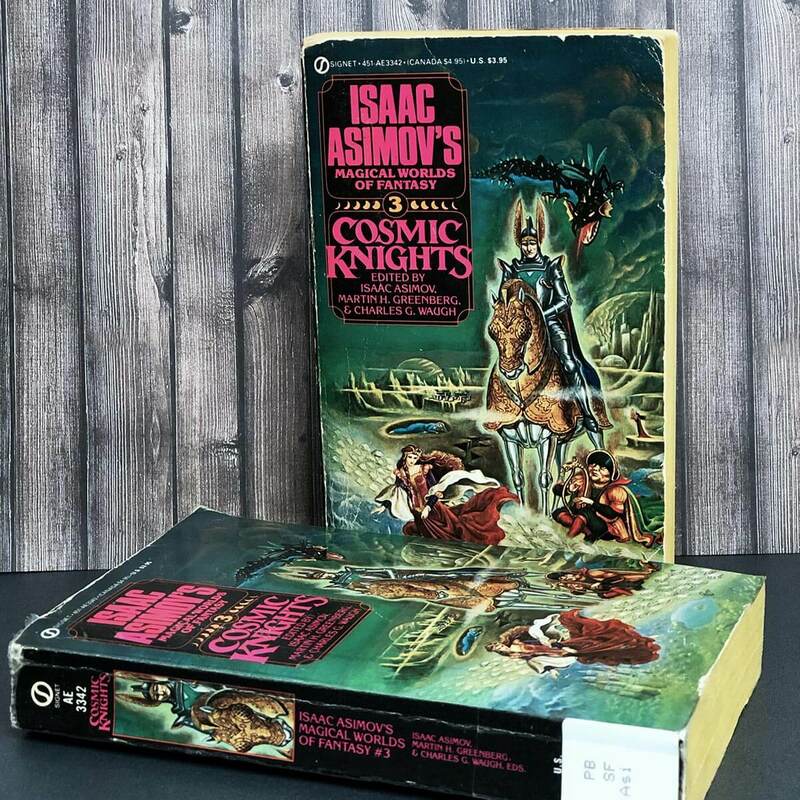 For me, one such notable work is actually a short story anthology — Isaac Asimov’s Magical Worlds of Fantasy Volume 3: Cosmic Knights. Originally published in 1984, Cosmic Knights collects shorts from as far back as 1939. Like many of my childhood discoveries, I found this at my local library. I borrowed it several times. Today, I own that original copy from my library, along with a second, slightly tattered paperback I picked up at a used bookstore. This collection is significant for me because of two stories: Divers Hands by Darrell Schweitzer, and Diplomat-at-Arms by Keith Laumer. To be honest, I haven’t read this book in at least 20 years, so most of the story details are lost to me. There are some distinct standout scenes that remain vibrant to me, though. But, more than anything, I remember the way those two stories made me feel. Divers Hands was creepy and atmospheric in a way I did not expect to find in this kind of anthology. Its imagery — an invading wave of disembodied hands, all taken from thieves and lawbreakers — was powerful and spine-tingling. As a teen, I figured out how to tell a condensed version of it as a campfire tale. I told that story at youth camps and retreats to small groups, young and old. It never failed to elicit shivers and wide eyes. It helped cement my love of darker fantasy, how a dash of horror and existential dread could take a fantastical story into challenging, evocative territory. The other short, Diplomat-at-Arms, blends old school science fiction with medieval fantasy elements – steeds ands squires, knights and gladiatorial arenas. Elements of Laumer’s short fiction carved out a place in my imagination. I glommed onto this idea of an aging peacekeeper, straddling genres and bridging the divide between societies clinging to different pasts and presents. Like a speck of dust gradually rolling and gathering particles until it becomes a stone and then a boulder, that seed of an idea from Diplomat-at-Arms soaked up other influences. Morphed and twisted and became something new. Now, the kernel of a concept I discovered as a boy is blossoming as a western-flavored science fiction story that I’ve been quietly tending to for years. When that series eventually reaches audiences, I doubt that original story-ancestor will be in any way visible. But I’ll always know it’s there, and will be grateful for it. What about you? What’s a specific book or story that you know changed how you perceived storytelling or directly influenced your own works? Join in the conversation on Instagram or on Twitter!